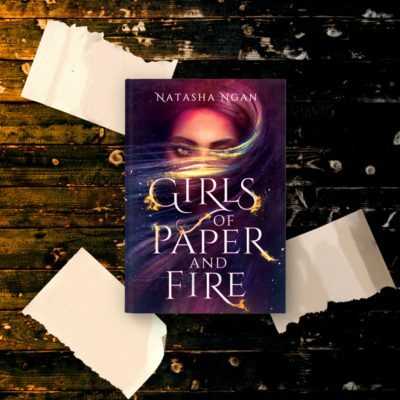 Girls of Paper and Fire is a stunning young adult fantasy novel by Natasha Ngan, full of Asian mythology and featuring a wonderful lesbian romance. It mixes in aspects of Ngan’s time growing up in Malaysia and follows Lei, a young girl who is kidnapped and forced to become a Paper Girl, one of the Demon King’s concubines. There is a tradition in our kingdom, one all castes of demon and human follow. We call it the Birth-blessing. It is such an old, deep-rooted custom that it’s said even our gods themselves practiced it when they bore our race onto the earth. When babies die before their first year, there are whispers like leaves fluttering darkly on the wind: the ceremony was performed too late; the parents must have spoken during it; the shaman who executed the blessing was unskilled, a fake. Coming from the lowest caste—Paper caste, fully human—my parents had to save for the full nine months after the news of my mother’s pregnancy. Though I’ve never seen a Birth-blessing ceremony, I’ve imagined my own so many times that it feels almost like a memory, or some half remembered dream. Picture smoke-cut night and darkness like a heavy black hand cupped round the world. Crackling fire. Standing before the flames—a shaman, his leathery skin webbed with tattoos, teeth sharpened to wolflike points. He’s bent over the naked form of a newborn, just hours old. She’s crying. On the other side of the fire, her parents watch in silence, hands clasped so tightly their knuckles are white. The shaman’s eyes roll as he chants a dao, painting its characters in the air with his fingers, where they hang above the baby, glowing softly before fading away. As he comes to the crest of the prayer, a wind picks up. The grass stirs in a feathery rustle. Faster and faster the shaman chants, and louder and louder the rustle and the wind, until the fire whips upward, a whorl of orange-red flame dancing high into the sky before flashing suddenly out. Then the shaman reaches into the air where the fire had been for the object floating in its wake: a small, egglike golden pendant. But the pendant isn’t what’s important. What’s important is what the pendant hides within. The baby’s fate. My fate. Our kingdom believes words have power. That the characters of our language can bless or curse a life. Inside the pendant is a single character. One word that we believe will reveal a person’s true destiny—and if my life will be blessed, as my parents hoped when they saved for my ceremony, or whether my fate is something far darker. Cursed years to be played out in fire and shadow. In six months, when I turn eighteen, the pendant will open and its answer will finally be revealed. Our shop is busy this morning. Not even noon yet and it’s already packed with customers, the room bright with chatter, Tien’s brusque voice cutting through the thick summer air. Sunlight streams in through the slatted windows, drowsy with cicada song. Sandals slap on the floorboards. Beneath it all, like the shop’s familiar heartbeat, comes the bubble of the mixing barrels where we brew our herbal medicines. The six tubs are lined along the back of the store, so big they reach my shoulders. Five are full of pungent mixtures. The sixth is empty, filled instead with me— admittedly also pungent after an hour’s hard work scrubbing dried residue from the buckled wood. I’m working at a particularly stubborn stain when Tien’s face appears over the edge of the barrel. Feline eyes rimmed with black; graying hair flowing softly over pointed cat ears. She regards me with her head cocked. I swipe the back of my hand over my forehead. Little nuisance. She’s been calling me that for as long as I can recall. “Only if you say please,” I retort, and her ears twitch. As she bustles off to deal with a customer, I smile despite myself at the proud flick of her neat lynx ears. Tien has worked for us for as long as I can remember, more family now than shop hand despite our caste differences. Because of that, sometimes it’s easy to forget that there are differences between us. But while my father and I are Paper caste, Tien belongs to the middle caste, Steel. Somewhere between my plain human body and the animal-like strength of Moon castes, Steel castes have elements of both, making them a strange meeting point between human and demon, like a drawing only halfway finished. As with most Steels, Tien has just touches of demon: a tapered feline maw; the graying amber cat’s fur wrapped around her neck and shoulders, like a shawl. As she greets the customer, Tien’s hands automatically pat down that messy ruff of fur where it pokes from the collar of her samfoo shirt. But it just sticks straight back up. My lips quirk. It must have been a prank by the gods to give someone as fussy as her such unruly hair. I climb over the side of the tub and catch a better look at the woman Tien is talking to. Her long black hair is pulled back, twining past a pair of elegant deer antlers as slender as vine. Another Steel demon. My eyes travel over her elegant kebaya glittering with silver embroidery. It’s clear that she belongs to an affluent family. The jewels dangling from her earlobes alone would keep our shop running for a year. As I’m wondering why someone like her has come to our shop—she must be from out of town; no one here has that kind of money—her gaze glides past Tien and catches mine. I just make out her murmur over the noise of the shop. My face flushes. Of course. She heard the rumours. I turn away, ducking through the bead-curtained doorway to the back rooms of our old shop building. The deer-woman’s elegance has made me extra aware of the state I’m in. Clumps of dirt cling to my clothes—a pair of loose sand-coloured trousers and a wrap shirt knotted at the waist with a frayed sash—and my ankles are soaked with the camphor liquid I was using to clean the mixing barrel. Stray hairs stick to my cheeks with sweat. Sweeping them back, I retie my ponytail, and my mind slips for a moment, remembering. Other fingers looping a red ribbon through my hair. A smile like sunshine. Laughter even brighter. Strange, how grief works. Seven years on and some days I struggle to remember her face, while other times my mother seems so real to me that I almost expect her to amble in through the front door, smelling like peony petals in the rain, a laugh on her lips and a kiss for Baba and me. With a shake of my head, I continue down the corridor and out onto the sunlit veranda. Our garden is narrow and long, bordered by a mossy wall. An old fig tree dapples the grass with shade. The summer warmth heightens the fragrances of our herb plot, the tangled patchwork of plants running down the centre of the garden, familiar scents rising from it to tease my nose: chrysanthemum, sage, ginger. Charms threaded along wire to keep the birds away chime in the breeze. A cheerful-sounding bark draws my attention. My father is crouched in the grass a few feet away. Bao wriggles happily at his toes as my father scratches the little dog’s belly and feeds him scraps of dried mango, his favourite treat. At my footsteps, my father quickly hides the fruit behind his back. Bao lets out an indignant bark. Bouncing up, he snatches the last piece of mango from my father’s fingers before running to me, stubbed tail wagging victoriously. I squat down, fingers finding the sensitive spot behind his ear to tickle. “About what you just saw . . .” my father starts as he comes over. I spring to my feet. “I’ll go and get it now,” I say, but my father shakes his head. Laughing, we head back into the house, our steps falling in line. For a moment, it’s almost like before—when our family was still whole, and our hearts. When it didn’t hurt to think of my mother, to whisper her name in the middle of the night and know she can’t answer. But despite his joking, Baba’s smile doesn’t quite reach his eyes, and it reminds me that I’m not the only one haunted by their memories. I was born on the first day of the New Year, under the watchful gaze of the full moon. My parents named me Lei, with a soft rising tone. They told me they chose it because the word makes your mouth form a smile, and they wanted to smile every time they thought of me. 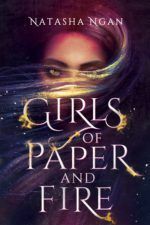 Even when I’d accidentally knocked over a tray of herbs or let Bao in to paw muddy footprints across the floor, the corners of their mouths couldn’t help but tuck up, no matter how loudly they shouted. But these past seven years, even my name hasn’t been able to make my father smile often enough. I look a lot like her, my mother. I catch Baba startling some mornings when I come down, my raven hair long and loose, my short frame silhouetted in the doorway. Though neither of my parents knew where I inherited my eyes. How did they react when they first saw them? What did they say when baby-me opened her eyes to reveal luminous, liquid gold? For most, my eye colour is a sign of luck—a gift from the Heavenly Kingdom. Customers request for me to make their herbal mixtures, hoping my involvement will make them more potent. Even demons visit our shop occasionally, like the deer-woman today, lured by the rumour of the human girl with golden eyes. What I don’t tell her is that sometimes I wish I were part demon. On my rare days off, I head into the valleys surrounding our village to watch the bird-form clan that lives in the mountains to the north. Though they’re too far to be anything more than silhouetted shapes, dark cutouts of wings spread in motion, in my mind’s eye I make out every detail. I paint their feathers in silvers and pearls, sketch the light of the sun on their wing tips. The demons soar through the sky over the valley, riding the wind in effortless movements as graceful as dance, and they look so free it aches some part deep in me. Even though it isn’t fair, I can’t help but wonder whether, if Mama had been born with wings, she’d have escaped from wherever she was taken to and flown back to us by now. Sometimes I watch the sky, just waiting, and hoping. Over the next few hours, the bubble of the mixing pots and Bao’s little barks play a familiar soundtrack while we work. As usual, my father takes consultations with new clients and meets with farmers and rare-plant traders from out of town, Tien deals with the general running of the store, and all the odd jobs nobody wants to do are handed to me. Tien frequently bustles over to chide me on the roughness of my chopped herbs and could I be any slower when picking up a customer’s package from the storeroom? Or do I need reminding that she’s a distant descendant of the legendary Xia warriors, so if I don’t work any harder she’ll be forced to practice her deadly martial arts skills on me? “Still sounds a lot more fun than this,” I grumble as I swelter in the storeroom sorting out deliveries—though I wait until she’s out of earshot before saying it. My last task of the day is refilling the herb boxes lining the walls of the store that contain ingredients for our medicines. Hundreds of them are stacked from floor to ceiling. Behind the countertop that rings the room, a ladder on metal rollers runs along the walls to access the boxes. I slide the ladder to the back wall and climb halfway up, arms aching from the day’s work. I’m just reaching for a box marked ginseng roots, my thoughts drifting to what Tien will be cooking for dinner, when a noise sounds in the distance. A low, carrying horn blow. At once, everything falls quiet. Conversations, the slap of sandals, even the simmer of the mixing barrels seems to drop. All thoughts of food are whipped away as I freeze where I am, arm still outstretched. Only my mind moves, lurching back, returning to that day. To claws, and screaming, and the feel of my mother’s fingers being torn from mine. For a few moments, nothing happens. It’s just long enough to hesitate. For a flutter of doubt to lift a hopeful wing. Then the horn sounds again, closer this time—and with it comes the pound of hooves. Horses, moving fast. They draw nearer, their heavy hoof-fall growing louder and louder, until the noise of it is almost deafening, and all of a sudden hulking shadows in the street block the windows at the front of the shop, casting the room into darkness. Distorted shadows, like the nightmare version of what a human should be. Stillness, and the dark pulse of terror. A baby wails in a house nearby. From further away comes a dog bark—Bao. A shiver runs down my back. He went off a while ago, probably to the food stalls to beg for treats or play with the children who ruffle his hair and giggle when he licks their faces. My father has moved to the bottom of the ladder. His voice is low, a rough whisper. He holds out his hand. Despite the hard set of his jaw, his face has drained. I step down from the ladder and weave my fingers through his, the quick trip of his pulse at his wrist a mirror to mine. Because the last time we heard the call of this horn was the night my mother was taken. And if that’s what the Demon King’s men stole from us then, what might they possibly take from us this time?